Poo-Pourri - Deja Poo scent. for me - I'm not sure whether to be very concise with only scientific lingo or whether to start cracking off with potty humor. 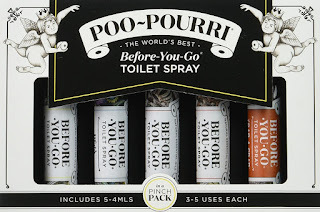 I think I'll try to keep the potty humor dialed back while I review an awesome product called Poo-Pourri. If you have ever been concerned about the unpleasant and embarrassing smells that are created while using the bathroom you might be interested in this bathroom smell eliminator. The makers of Poo-Pourri advertise it as "safe to breathe and safe to flush". When I had the opportunity to use it over several days, it did work every time. It eliminated or covered any smells that I didn't want to share with others. I was introduced to this product during a recent trip to visit my son and family. When they mentioned the spray, I was very skeptical. After all... doesn't the smell happen on the way to the toilet water? Isn't spraying the toilet water a little like closing the barn door when the horse has been running around the field? And... the Poo-Pourri was so STRONG! I took a sniff and thought about my migraines. I thought the spray would certainly trigger a migraine. Despite my negative thoughts, I tried it. And it did work. After flushing, all I smelled was the Poo-Pourri. The scent did not trigger a migraine - despite being very strong. I am purchasing some Poo-Pourri of my own. I really like the "in a pinch" sized bottles. I can carry them with me into public restrooms. I have to admit that when I travel (and when I've been fighting migraines) my schedule is off and I end up using public bathrooms. I don't like feeling like I have to wait until the sink area of a public bathroom has to clear before I dart out of a stall... pretending as though "that wasn't me!" Now I can exit a public bathroom stall smelling as fresh as a flower garden. 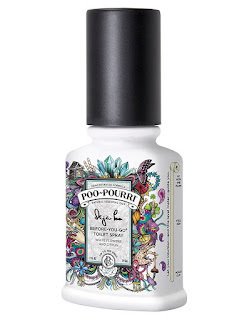 Poo-Pourri "in a pinch pack"
There is a variety of Poo-Pourri scents to choose from. Deja Poo, Original Citrus, Secret Santa Claus Christmas, Royal Flush, Tropical Hibiscus, and more. You can shop the Poo-Pourri store on Amazon or you can check out the Poo-Pourri website for more information. I agree that this product really does work, Dawn Rae. We sell Poo-Pourri at the Ace Hardware I work for AND we use it ourselves in the public bathrooms at the store, so it does work and it does smell fresh and pleasant. In fact, our sales display for Poo-Pourri just happens to be located right next to our bathrooms. Appropriate! :) The first time I saw it, the name made me laugh. I LOVE that your work display is near the restrooms! Awesome. Aren't the assortment of names just hilarious ?!! Haha! Thank you for answering the very first concern I had, triggering migraines! Very glad to hear that it doesn't cause those horrible headaches. It would be really nice to eliminate the embarrassment always around using the restroom. Sounds like a little bottle I need to carry with me everywhere. I was very careful not to spray the Poo-Pourri in the air. And... in a small residential bathroom, I only flushed when I was completely done and ready to run out of the room just as a migraine precaution. I did not have any inkling that the poo-pourri was going to trigger a migraine. However, I think I'm ordering the citrus smell instead of the Deja-Poo... just to make sure. In general, I do better with citrus and peppermint essential oils. Thanks for reviewing this product. I have seen the ads but no one I know has tried it up to now! Will get some for sure. Heather, I was really surprised at how much I liked the stuff. If you get some I hope you let us know if you like it. LOL! I can just picture you laughing as you sat down to write this. I think I might have to try this. My mom had a version of this stuff (I presume it wasn't the same stuff? or maybe it was) in her washroom for years, and I can vouch for it, it works! I think this is something I'd like to try. Thank you for a great review. I'd never heard of it. Practical with a touch of humor for the names, too funny! For those of us who have always wondered... thanks for the review!